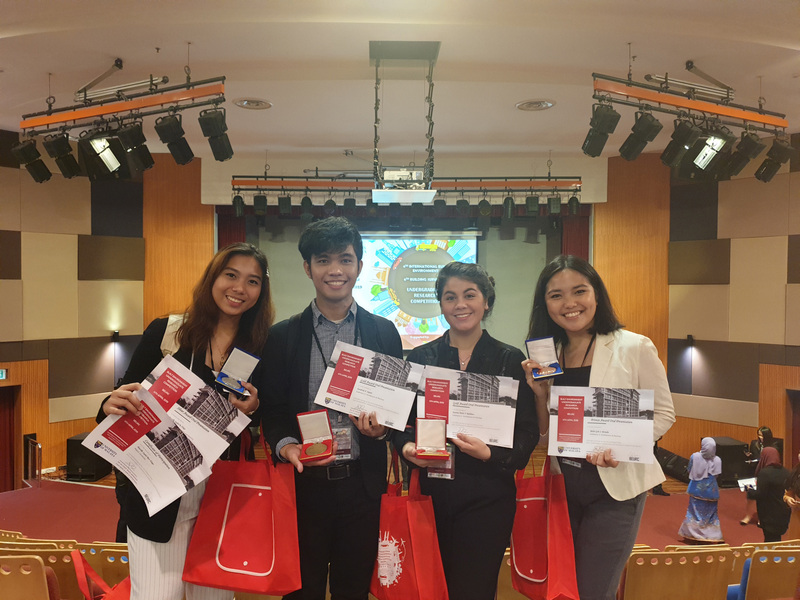 (L-R) Mapúa University Architecture students Beacille R. Elago, Kendrick N. Supnet, Katrina Marie T. Redshaw, and Robin Gale S. Bernabe at the 4th International Built Environment Undergraduate Research Competition (BEURC) held on April 4, 2019, in Kuala Lumpur, Malaysia. Supnet and Redshaw won the gold award, while Elago and Bernabe won the silver and bronze awards, respectively. Four Bachelor of Science Architecture students of Mapúa University won in the 4th International Built Environment Undergraduate Research Competition (BEURC) held last April 4 in Kuala Lumpur, Malaysia. Katrina Marie T. Redshaw, with her study titled “Aiding Agricultural Productivity in Declining Crops through Bioclimatic Protective Structures,” and Kendrick N. Supnet, with his study “Creating Earthquake Resilient Communities in Addressing the Aftermath of Building Collapse,” both bagged the gold award. Meanwhile, Beacille R. Elago, with her study “An Analysis of Restricted Space on People Reforming: A Case Study,” and Robin Gale S. Bernabe, with her study “Closed Loop Approach for Minimizing Waste in Designing Coastal Communities,” won silver and bronze, respectively. BEURC, organized by the University of Malaya in Kuala Lumpur, is a research competition for students in built environment programs from around the world. The competition aims to give exposure and training to the student researchers. It adheres to the core elements in built environment such as building control, building surveying, architecture, planning, facilities management, real estate engineering management, and construction management.